I modeled a house in virtual reality. My notes on the survey of existing conditions and benefits of software drafting. Enjoy! Starting with a pencil, notepad, and several different length tape measures, I took dimensions. 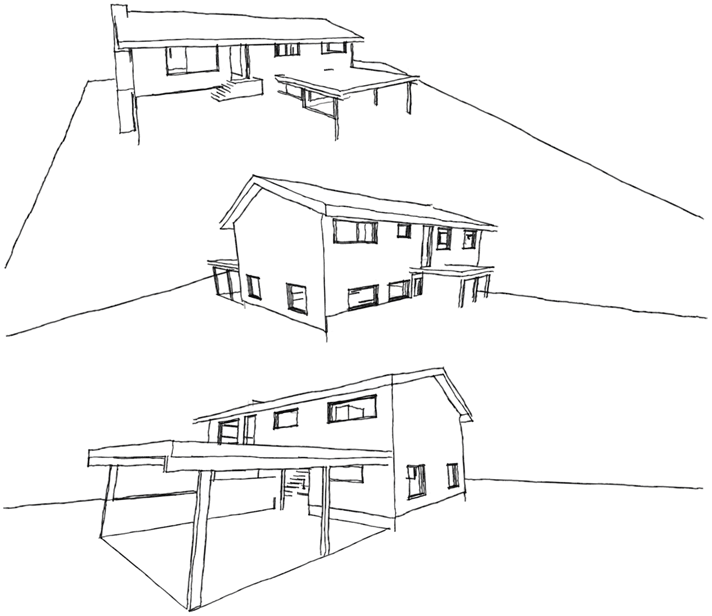 Sketched the exterior dimensions of the building, foundation, and carport. Next I measured the interior dimensions of the rooms and windows. Estimating the pitch of the roof I derived its dimensions. Finished up my notes with the front porch and back deck. I turned to the SketchUp environment for three-dimensional modeling on my Mac. The 'push-pull' tool to transform two dimensional objects into the three dimensions is great. I used the 3D inferencing feature to make sure my input was correctly aligned. I learned to create components, groups, and layers to manage the objects in my model. Thanks for sharing. Happy Birthday. This page contains a single entry by sky published on October 31, 2008 8:11 AM. cybo's own home on the web was the previous entry in this blog. The man who skied down everest is the next entry in this blog.